Who says you can't combine striped pants, a leather wrestling belt, purple star-spangled vest, and a light blue puffy pirate shirt and make it look good! Oh, right -- this guy. As jarring as it is to see purple and aqua on an outfit that's ostensibly based on the flag of the USA (which, need I remind you, contains neither purple nor aqua, nor wrestling), even worse to my bleeding eyes is the jaunty red flight-attendant cap he's sporting. I can just imagine him leaping into this heated battle with the heinous Nazis screaming "Coffee, tea, or ME!" The bad costume is what brought us here today, but I can't close without saying a word or two about the name. "Yankee Doodle Jones"? Really? There's nothing like an implied "Dandy" to make your enemies tremble in fear. Or possibly titillation, depending on their proclivities. 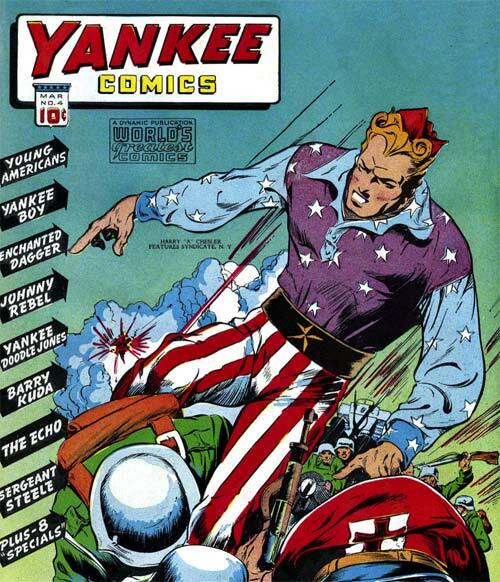 But perhaps this was just the forerunner of a whole clan of Yankee Doodles, like Yankee Doodle Sam and Yankee Doodle Fred and of course, cousin Yankee Doodle Betty. "Darling, the Yankee Doodles are coming over for dinner tonight, so be sure to break out the good star-spangled purple and aqua table cloth, won't you?" Captain America, you have been called before this Senate Sub-Commitee for your un-American activities, namely your costume. Yes, it does boldly sport the colors red, white, and blue, but I do not see a single stitch of aqua or purple, ant frankly sir, that is nothing short of unpatriotic! I’ve said it once, I say it again: Costumes should not be themed on national flags. Colour themes of flags are in most cases awful in themselves and when combined with design of a costume – a task difficult enough to get right in its own right – it just adds another layer of possible fashion catastrophe. Plus personally I don’t like five pointed stars. I dont wanna be pirate! ajw (4): Hey! Pirates ate in this year! If it’s any consolation, Myro, I totally read it as “are” the first time. If pirates were forced to wear this outfit, they would eat in this year; who could stand the embarrassment of being seen in public? I’m actually more intrigued as to who “Barry Kuda” is.